For the refugees camped out on the Greek-Macedonian border, the day begins with hope – as it has every day for weeks. Maybe today the Macedonians will open the border. Maybe today it won’t rain and clothes and tents can be dried out. Maybe today there will be more food. Maybe. Hope is all they have to drag them through days that swing between monotonous boredom hunched in their tents when it pours and a frantic scramble to get food and to repair tents when the sun shines. Hope is what draws the newcomers, 500 to 1,000 a day. Hope was high on Monday. The refugees believed the summit between European Union and Turkish leaders would produce some good news for the estimated 16,000 refugees, mostly Syrians and Iraqis, camped in the muddy fields outside this small village. And they still think some deal has been made that will allow their immediate passage north to the countries they most want to settle in: Germany, the Netherlands and Sweden. Few understand that the EU and Turkey have provisionally agreed to a deal calling for the EU to resettle one Syrian refugee from Turkey in return for every Syrian refugee Turkey takes back from Greece. Nor have they understood the implications of a Turkish proposal to accept the return of all war refugees and economic migrants who cross the Aegean to reach Greece in order for EU countries to resettle asylum-seekers they will take directly from Turkey. Greek Prime Minister Alexis Tsipras has said he finds the proposal "interesting." EU leaders are due to meet next week to finalize a plan that has provoked the anger of UN refugee chiefs and rights groups. The UN’s refugee agency has warned any blanket return may violate international law. If enacted, the plan is likely to provoke not just anger among those here. The few refugees who do understand some of the plans under review say they will resist. "There’s war in Syria; there will be war here," said Abdul, a 32-year-old father of two toddlers from Idlib. "I didn’t risk the journey here – a sea crossing with my wife and kids – to be taken back." A blanket return of refugees would prompt uncomfortable historical echoes of the forcible population swaps of Christians and Muslims between Greece and Turkey following the Greco-Turkish War of 1919-22. Reporters are questioned frequently about what they have heard. "Will the border open today?" refugees ask with words or gestures, bringing their hands together or separating them. "No" prompts a sad, reciprocal shake of the head and sometimes some muttering. Rumor spreads like wildfire here. It took less than an hour for this one to circulate: An Egyptian journalist told some refugees that they'd soon be moved to other Greek camps, from which the European countries that wanted them would conduct airlifts. 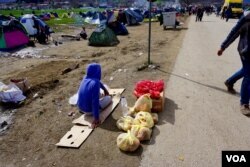 The number of police at the squalid, makeshift camp has increased noticeably this week. One policeman confided to VOA of growing anxiety about a reaction – possibly a violent one – when refugees, with hopes buoyed by the summit, learn they are not going to be airlifted out and deposited in their country of choice. "We don’t want a repeat of what happened the other day," he said, referring to the February 29 clash between some refugees and Macedonian border guards. Asylum-seekers had shaken the razor-wire fence blocking their way, prompting the guards to fire rubber bullets and tear gas. Tension remains high in the under-resourced camp. Tempers and anger can flare rapidly. With a respiratory infection raging through the camp, sickening kids, parents’ anger is rising, as is their anxiety for their children’s well-being and their dismay at the insufficient numbers of doctors available. "We queue for hours to see anyone," said Hanan from Palmyra. She has three young children, all ill. The youngest, age 2, is feverish and has been coughing and wheezing for days. In the last few days, several fistfights have broken out in the long, meandering and time-consuming queues for free food being handed out by Médecins Sans Frontières (MSF) or Doctors Without Borders. The French medical charity has found itself substituting for the absent Greek authorities and, while doing the best it can, has become overwhelmed. The charity has appealed publicly for other Western NGOs to step forward and help. A local Greek charity called Praxis is on the ground but lacks sufficient experienced staff. The International Rescue Committee at midweek sent an exploratory team to see what they could contribute. In the meantime, there’s a small presence by the U.S.-based Save the Children, which this week released an undercover report estimating that more than 250,000 youngsters live in fear in besieged areas of Syria. UNHCR, the United Nations’ refugee agency, has an even smaller presence, and at least one MSF worker alleged its representatives spent most of their time briefing the press. "They aren’t actually doing very much," the MSF worker told VOA. 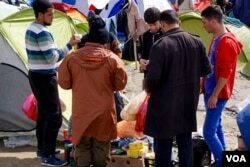 A Praxis worker said: "What is happening here is disgracing Europe – it is shaming Europe." One portly, middle-aged woman from the Syrian city of Aleppo charged up to a group of reporters Wednesday in tears, waving a cardboard box. She angrily explained that's all she got after asking for something to waterproof her tent and waiting in line for an hour and a half. "See how we are treated," she screamed, demanding that reporters do something about it. Her rage mounted when the sheepish journalists explained there really wasn’t anything they could do. But refugees generally remain friendly to reporters and news photographers. The kids follow the media around, demanding to have their pictures taken. But some adults show unease with cameras shoved in their faces; many photographers who lack Mideast experience seem oblivious to the highly reserved, private nature of more traditional women from the region. Most reporters are bracing for the likelihood that refugees will tire of the media attention, feeling that they are being treated as circus acts. For now, though, the media offer a safety valve through which the refugees vent their lamentations and complaints. Among those complaining Wednesday were some enterprising refugees and locals who have been selling basic foodstuffs – from bread and fruit to soft drinks and processed cheese – from stalls set up on crates or from the back of cars. They said police have hassled them, telling them they must stop trading. Says Semaan, a Syrian from Aleppo who has been selling soft drinks: "I think they want to make refugees even more uncomfortable, to pressure them so when the time comes to move them away, they might not resist."